Pasta is one of my first loves. From my mom’s desi macaroni, to heavy sauce-y and cheesy restaurant preparations to my current favourite type – simple, with a few concentrated flavours and a lot of texture. I find that it makes a wholesome, hearty and very satisfying meal. What I love most about pasta is that it can be as simple or complex as you like. 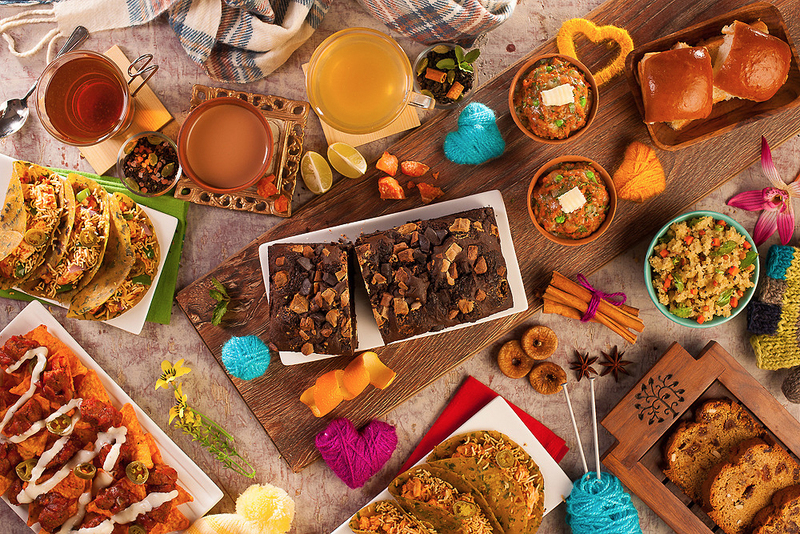 The options, flavours and combinations are endless. 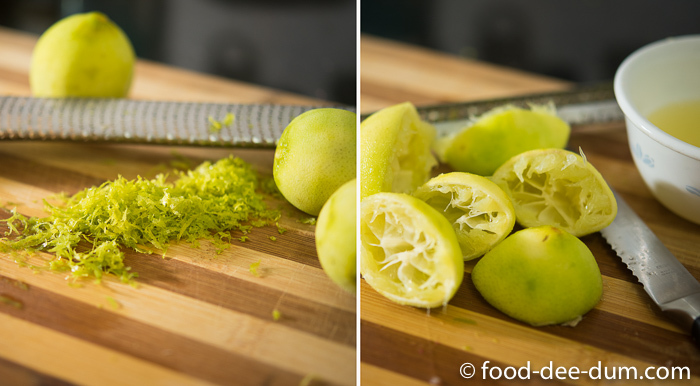 This recipe here is one that I have been wanting to try out for a while – it’s lemony, it’s garlicky, it’s spicy and has a lot of crunch from toasted pine-nuts and toasted breadcrumbs. I’ve been crushing on the lemon-garlic flavour combination for a while and I couldn’t wait to put this together! 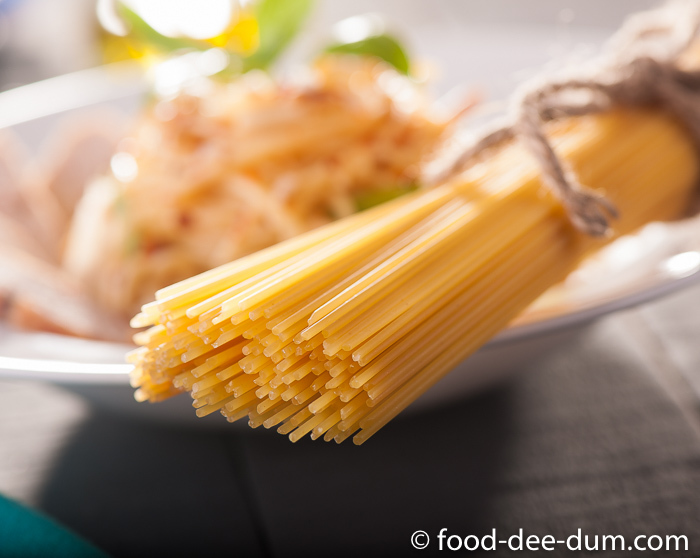 The recipe is adapted from one I learned from an Italian chef, who I met at a restaurant event last year – he cooked up a few different pastas and gave us the low-down on good pasta preparation, the Italian way! He made this recipe using prawns, but since AK is allergic to seafood I went with the chicken option! I like that this recipe uses a few key flavours but has the potential to be quite sophisticated. You can mix everything up in the end and make it a one-bowl meal or pretty up the presentation. Want more? Eat it cold as a salad or bake it topped with more cheese on a colder, drearier day. Whatever you do, do try it and make it your own. 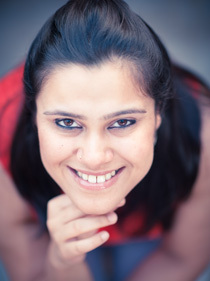 This post is my entry for IndiBlogger’s Del Monte #ItalianEscapades Contest. Zested and juiced the lemons. Using a meat mallet, I flattened out the chicken breasts to even them out to a similar shape and thickness for even cooking. 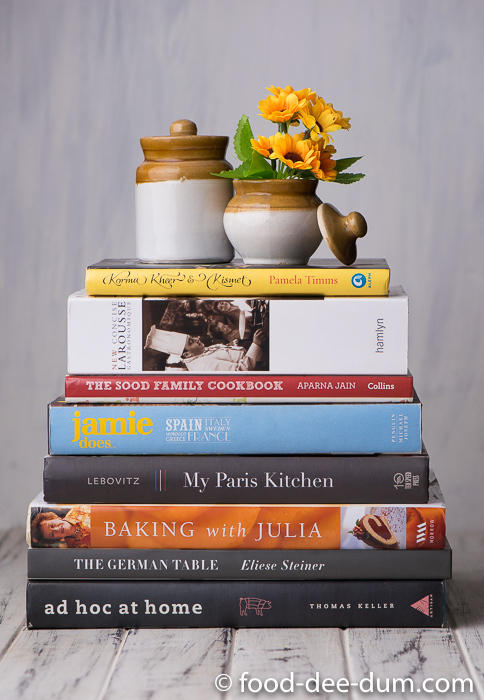 You can use a rolling pin or a heavy pot. Then I seasoned them with salt & pepper placed them in a shallow non-reactive bowl and poured the juice all over them. Setting the chicken aside to marinate for a while, I heated up a skillet and gently toasted the breadcrumbs and pine nuts (separately) until they were a few shades darker. I set them aside. Before making the chicken, I set water & salt to boil in a large saucepan for the pasta. Once the pasta water was on the stove, I used the skillet to heat up the canola oil and pan-grilled the chicken breasts. I just lifted the chicken from the marinade (leaving the lemon juice behind) placed it on the hot skillet. I usually sear the chicken on both sides (approx 1 minute on each side on high heat) and then cover the skillet with a tight fitting lid, cooking the chicken further on low heat until done, about 7-8 minutes. Lifting the chicken out of the skillet, I placed it on a plate and let it rest, covered, while I got everything else together. I left all the pan juices in the skillet. Ideally, I like to start with the sauce once the pasta water has come to a boil. Once the water came to a boil, I added the pasta and let it cook until al dente — for about 7 minutes, as per the packet instructions. While the pasta was cooking, I warmed up the skillet again and added the butter. Once it melted, I added the olive oil, keeping the heat at medium. Once it was hot, I added the minced garlic and fried it for about a minute. Next went in the chilli flakes and fried for another minute. Lastly, the lemon juice and everything else leftover from the chicken marinade. I stirred it until it thickened slightly, about a minute. 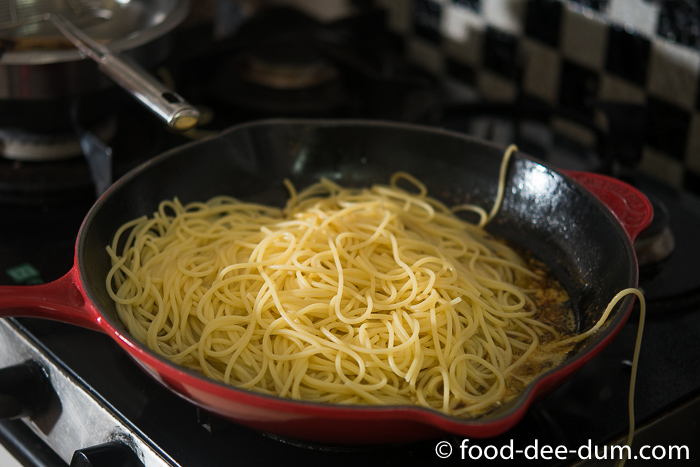 By now, the pasta was done so I lifted the pasta out of the water using a large slotted spoon and transferred it to the sauce skillet, along with a splash of the pasta water. 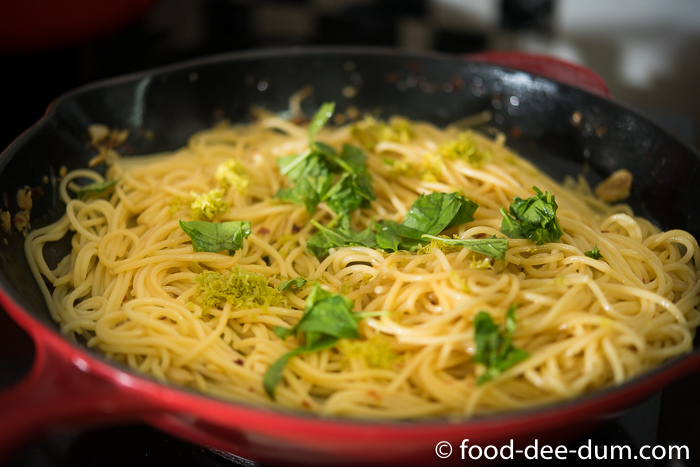 I stirred it around until well coated and then added the lemon zest and torn basil leaves, reserving a few for garnish. 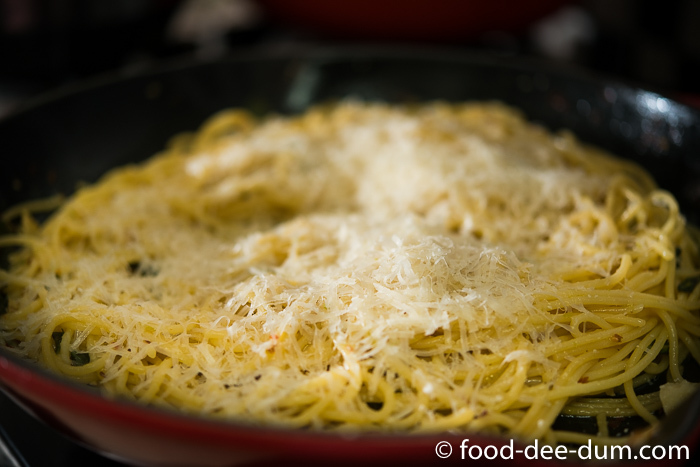 Lastly, I turned off the heat and added the grated parmesan and stirred it all to combine. To serve, I divided the pasta between 2 shallow bowls. Slicing up the chicken breasts, I divided them amidst the two bowls as well. To finish up, I added some fresh basil leaves, a generous sprinkle of red chilli flakes, black pepper, the toasted pine nuts, toasted breadcrumbs, some grated parmesan and a drizzle of the olive oil on each. And we’re done! 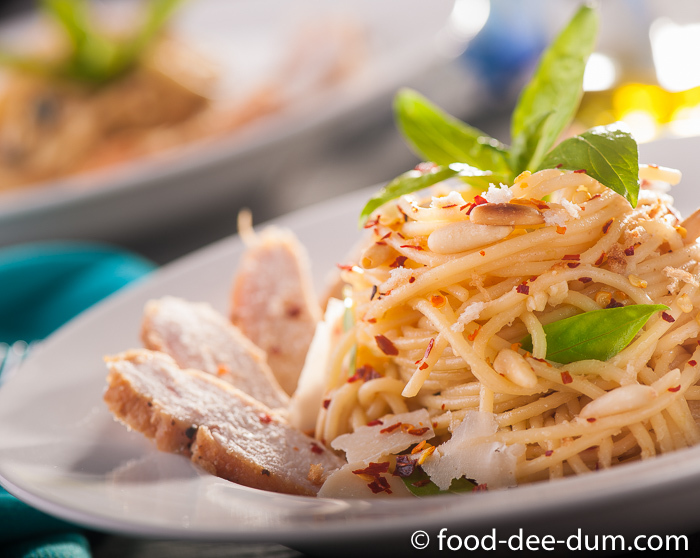 2 bowls of flavourful, zesty, cheesy pasta were up for grabs! I told you it was easy. And delicious. Now do you believe me? Go try it for yourself and tell me if I misled you! Update on 7th September: this recipe made it to the Top 6, winning me INR 10,000/- worth of Amazon.in vouchers! I’m so excited to use them. Watch Chef Ranveer Brar cooking up my recipe and hear what he had to say about it – click here to to see the video. 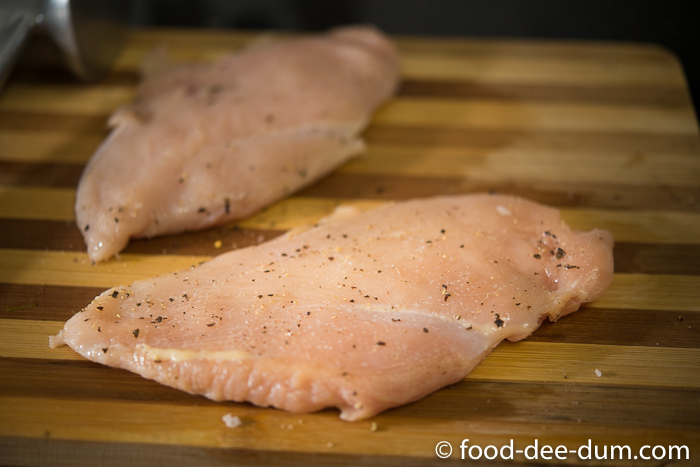 Flatten the chicken breasts to an even thickness by pounding them with a meat mallet or a rolling pin. Season with salt and pepper. Place these in a shallow bowl and pour the lemon juice over them. Set aside. 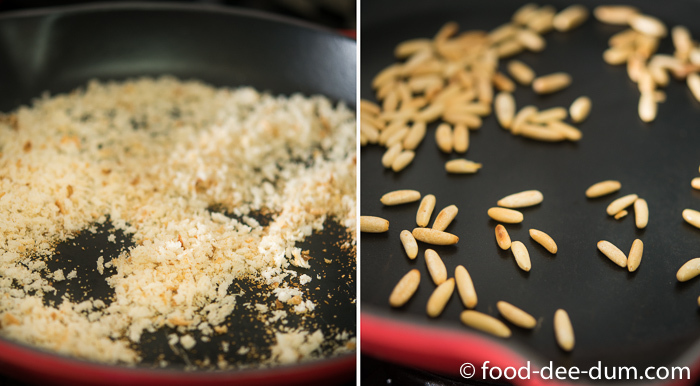 In a skillet, toast the breadcrumbs and pine nuts (separately) for a few minutes until golden. Set aside. 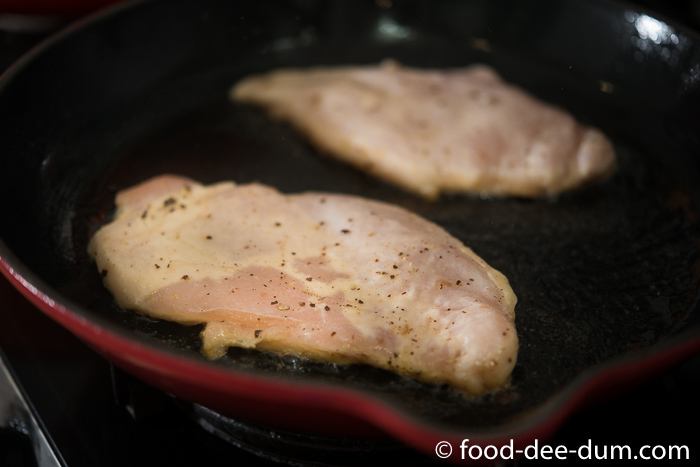 In the same skillet, heat the canola oil and pan-grill the chicken. Lift the chicken out of the marinade, leaving the lemon juice behind. 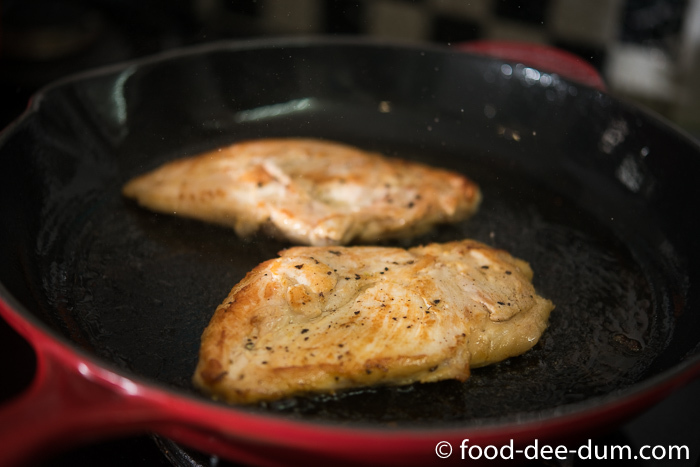 Begin by searing the breasts for 1 minute on either side and then cover with a tight fitting lid. Lower the heat and cook for about 7 minutes or until done. Remove onto a plate and keep covered until needed. Leave the pan juices in the skillet. Set the water to boil to cook the pasta, adding salt to it. Once it comes to a boil, add the pasta and cook until al dente as per packet instructions, approx 7 minutes. While the pasta is cooking, heat up the chicken skillet again. Add the butter. Once it melts, add the olive oil. Once it has warmed up, add the garlic and fry on medium heat for a minute. Add the red chilli flakes and gently fry for another minute. 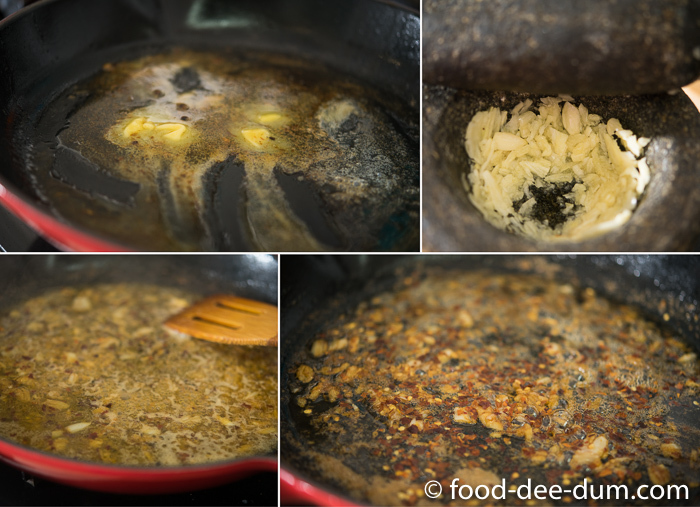 Add the lemon juice and other leftovers from the chicken marinade to the skillet and cook, stirring, for another minute or until slightly thickened. 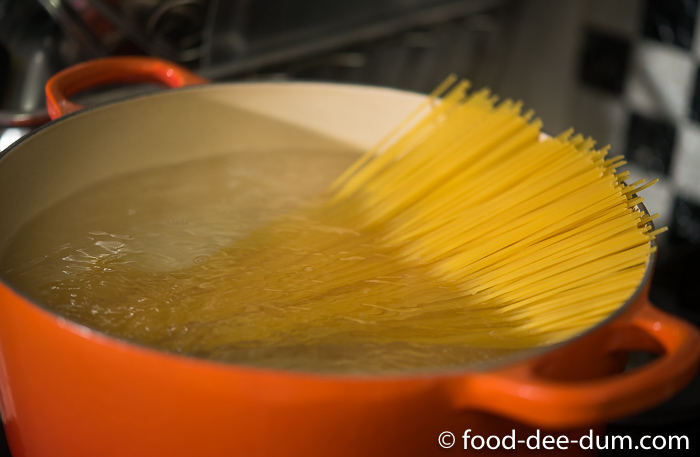 Lift the cooked pasta from the water and add to the sauce, along with a splash of the pasta water. Stir until well coated. Add the lemon zest and the torn basil leaves, reserving a few for garnish. Toss well to coat and remove from heat. To serve, divide the pasta amidst 2 bowls. 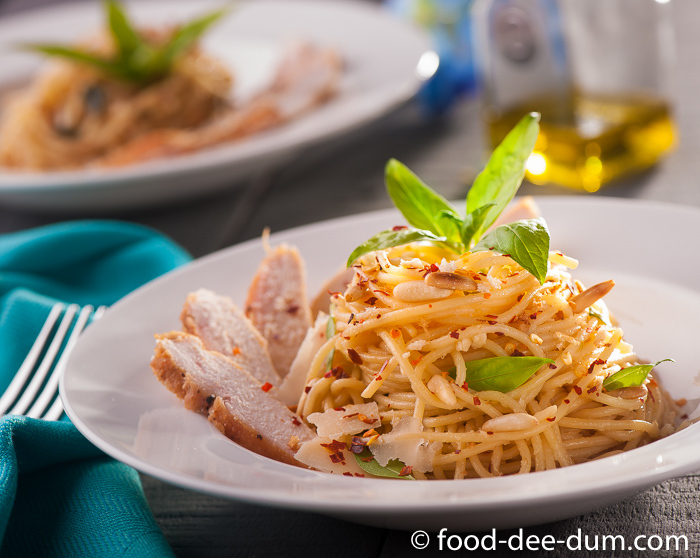 Slice the chicken breasts and arrange over the pasta. 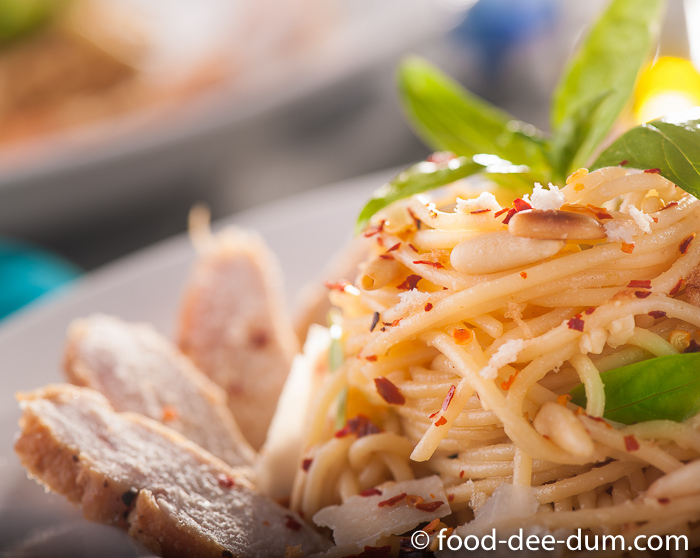 Sprinkle with more parmesan cheese, red chilli flakes, freshly cracked black pepper, toasted pine nuts and toasted break crumbs. 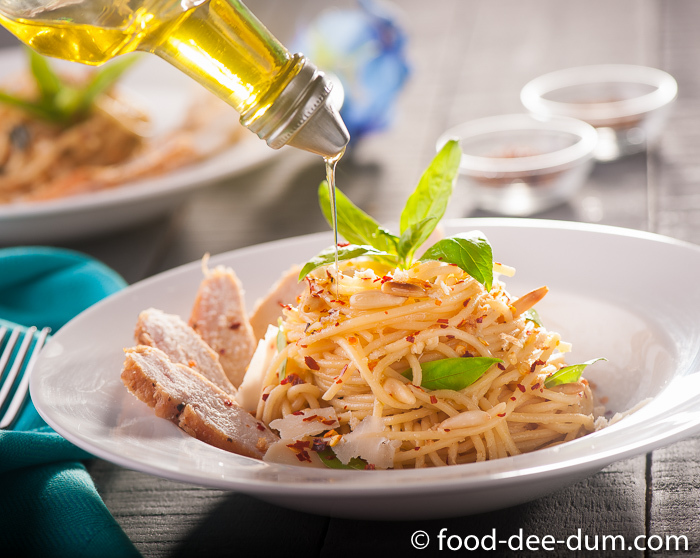 Drizzle with olive oil and garnish with some fresh basil.